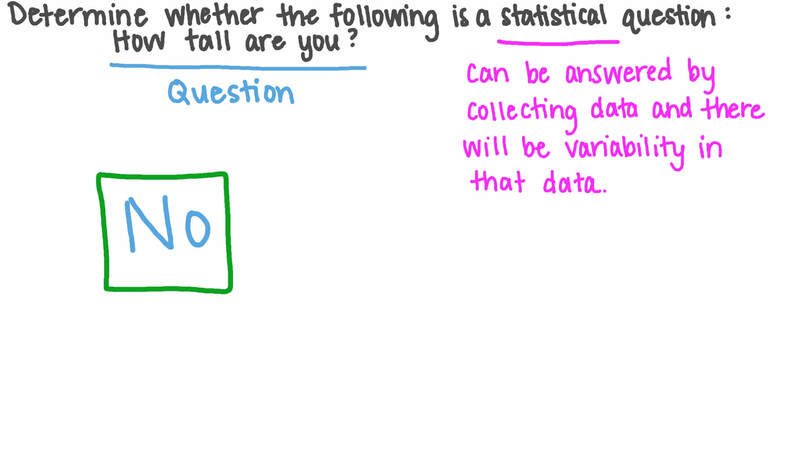 In this lesson, we will learn how to differentiate between statistical and nonstatistical questions. Determine whether the following is a statistical question: How tall are you? AIt is a statistical question. BIt is not a statistical question. 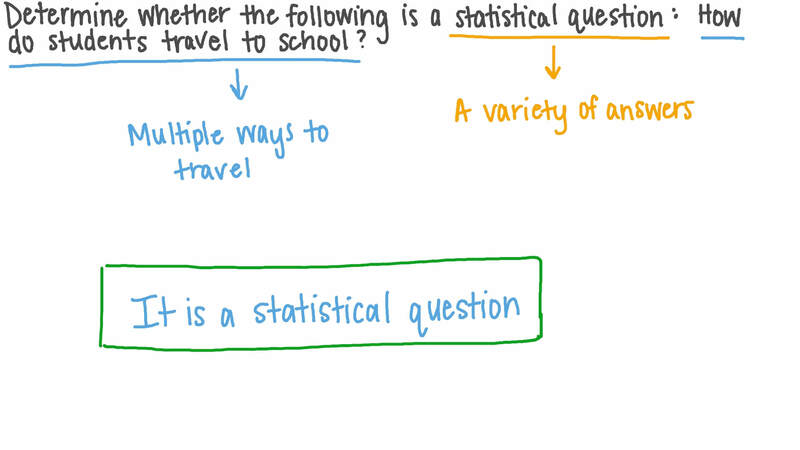 Determine whether the following is a statistical question: How do students travel to school? AIt is not a statistical question. BIt is a statistical question. Can a statistical question be answered by collecting data, where there is variability in that data? Determine whether the following is a statistical question: In general, how tall are humans? Determine whether the following is a statistical question: What is the weight of your cat? Determine whether the following is a statistical question: How many text messages do students in your class send in one day? Determine whether the following is a statistical question: What are the heights of the players of your favourite football team? Determine whether the following is a statistical question: What is the average number of words on a page in your science textbook? Determine whether the following is a statistical question: Do you like watching movies? Determine whether the following is a statistical question: What is your favourite subject? Determine whether the following is a statistical question: How many hours did you sleep last night? Upon asking a question in a survey, do you expect all responders to give the same answer? Determine whether the following is a statistical question: What is your favourite type of cake? Determine whether the following is a statistical question: How many hours per day do children spend playing games? Determine whether the following is a statistical question: What is the ice cream flavor most favored by people in your city? Is the following statement true or false? A statistical question is defined as being one that can be answered by collecting data, where there will be variability in that data. Can line plots be used to help show the variability in the data used to answer a statistical question? Can bar graphs be used to help answer a statistical question? Determine whether the following is a statistical question: How did you get to school today? Can a flowchart be used to help show the variability in the data used to answer a statistical question? Two students think about the following question: What t-shirt size do students in your class wear? Maged says that it is not statistical, while Amir says that it is. Which student is wrong, and why?? AAmir, since the question has a single answer. BMaged, since it is likely that there will be a range of answers for different people in the class. Determine whether the following is a statistical question: How many hours did you spend playing games yesterday? Which of the following is an example of a statistical question? AHow many text messages do you send in one week? B Who was the 10th president of the United States of America? C How many feet are in one yard? D What is the height of Mt. Everest?